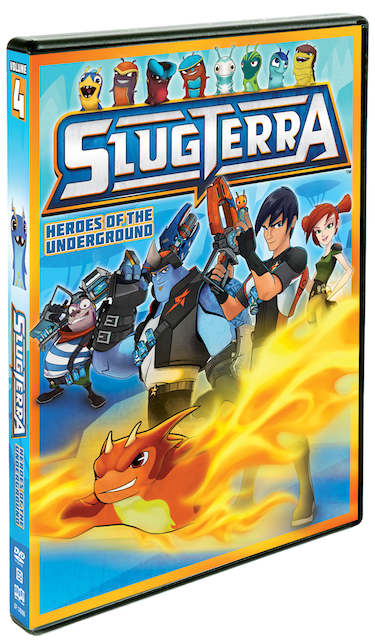 On March 4th, 2014, Shout Factory Kids, in collaboration with Nerd Corps Entertainment, will release Slugterra: Heroes of the Underground on DVD! Last year when I was first asked about reviewing this cartoon, I was confused as anything about what the heck this show was. We had never heard of Slugterra nor did we realize it was even a television program. Thank goodness I didn't let that stop me from reviewing it as it was so good last time around, there was no questioning the boys as to whether or not they wanted another new Slugterra DVD! This is the second DVD collection based on Nerd Corp’s highly popular animated action series! Included are five episodes as well as two bonus features including more animated Slugisodes and a drawing your own slug tutorial. The synopsis says "In this collection, join our hero Eli Shane, his gang of slugslingers, and his best slug buddy Burpy on their numerous adventures. Whether they are thwarting a mad scientist, facing an Ice Ogre or questing after fabled treasure, Eli and the rest of Shane Gang prove they are ready to slug it out!" I have to say not only are both boys totally obsessed with this show since the first DVD arrived but we've also discovered it in other places like Netflix or TV to watch. It was filled with action and Dane said he loved how after each task or level completed they "got a new slug"! I really thought it was a cute "boyish" program. Recommendation: Both boys enjoyed watching this and I actually thought it was pretty cute too! I definitely think at $15 its worth it to purchase since I know we sure have watched our moneys worth of the last one and probably already this one!